A few weeks ago I experimented with matzo balls for the first time! I know it’s crazy, I have been cooking for over two years and never once made my own matzo balls. I’ve used a mix before, but even then only once. I grew up in a very ‘heimish’ home, with amazing food, but when I discovered cooking I was drawn to bright colors, experimentation, and creativity, things I didn’t really see in classic heimish cooking. What I realized over time is the not every dish needs to be a completely new invention; some of the classics are still the best and can even be made better with some sort of spin. So that’s what I decided to do with matzo balls. I found a few recipes online that looked like good places to start, and played around with them a bit. I noticed that they all called for schmaltz. I don’t have any schmaltz lying around the house, but I did have delicious duck fat, which ended up being a perfect (or possibly even better) substitute! Next came the hard part: I like ‘floater’ matzo balls, not those dense sinkers. To make them as light and fluffy (think: a cloud) as possible, I decided to go with a little baking soda and that really did the trick. For this first time I kept it simple, and mixed half of the batter with some spinach and the other half with ground sun-dried tomatoes. Then came the real test: actually cooking them. At first I was skeptical that it would work, but within a few seconds they floated right to the top! It was pretty exciting to watch! Turns out, I grossly underestimated how much they would expand! They kind of took over the pot and formed one gigantic matzo ball. Lesson learned for the next time: use a bigger pot! Now that I knew how to make matzo balls, I was excited to change it up. Using the same approach as I take to my challah, I wasn’t satisfied with a plain matzo ball. I wanted it to be exciting, and since I was making creamy tomato soup I thought that a roasted tomato and garlic inside would make for a nice, complimentary surprise! 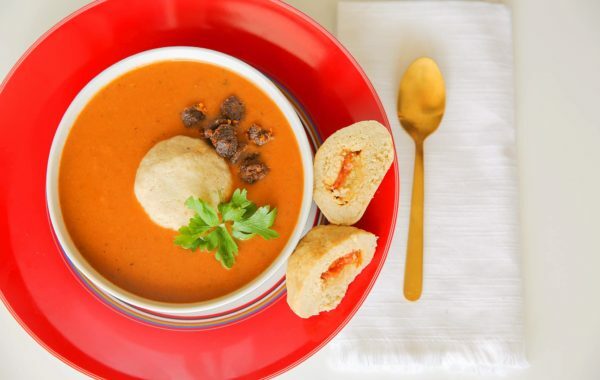 These matzo balls are perfect for Pesach and all year round! 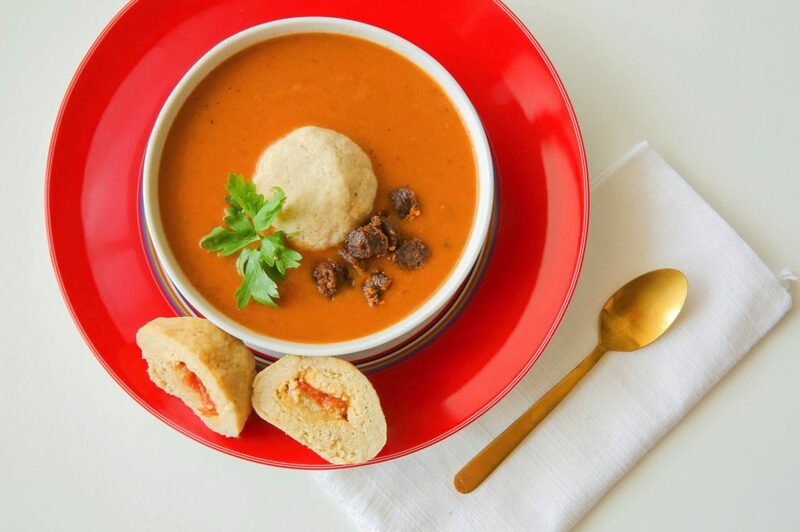 The soup, however, is best-served chametz, as I used croutons in the soup base to give it a deliciously creamy texture. But definitely give it a try with matzo crumbs if you’re feeling adventurous -that should work out too, and let me know if you do! Whisk the eggs together in a bowl. Add in the melted duck fat. In a separate bowl whisk together the matzo meal, baking powder, salt, onion, garlic, and pepper. Slowly mix the dried ingredients into the egg batter, making sure to not over mix the batter. If your batter is too crumbly add in the 1/4 water as needed, to achieve a thick batter. Bring a pot of water seasoned with salt and pepper to a boil. You want a wide pot for this, rather than really deep, so you can cook as many as you can at once . Remove the matzo mixture from the fridge. Take some batter into your hands and form into a flat circle around the size of a mug opening. Place a tomato and garlic in the center and bring the walls up around them. Take some more matzo batter and cover the filling. Using your hands close the seams and form into small golf- sized balls. Place the matzo balls into the pot, making sure not to overcrowd them. Cover the pot and let cook for 20-30 minutes without lifting the lid! Remove with a slotted spoon. Can be served in a tomato, minestrone or chicken soup! 1.For the garlic confit, use the recipe posted on my challah post. Make the confit as usual and use some of the garlic for these matzo balls! 2.To roast the tomatoes, place whole cherry tomatoes on a parchment lined baking sheet. Drizzle with olive oil, coarse sea salt, oregano, thyme and freshly cracked black pepper. Roast on 400 F for around 20-30 minutes until they start to blister. Roast as many tomatoes as matzo balls you plan on making, plus a few more, trust me you'll want to snack on them! Place the cut side of the plum tomatoes down on a parchment lined baking sheet. Set the oven to broil and broil for 5-10 minutes until tomato skins have blackened. Remove from oven. Allow them to cool and then remove the skins and discard. In a large stock pot, heat up the olive oil. Add in the shallots and garlic and sauté until golden and fragrant, about 2-4 minutes. Add in the tomato paste and sauté for another minute or two. Add in the roasted plum tomatoes and the can of whole peeled tomatoes. Using the back of your mixing spoon, break up the whole tomatoes to let out the juices and allow to cook for 5 minutes. Add in the bread crumbs and mix well, until absorbed with the tomato juices. Add in the stock, water, sugar, fresh and dry herbs. Cover the pot and bring to a boil. Lower the flame and allow to simmer for 20-30 minutes. Remove the soup from the flame. Add in the sour cream and using an immersion blender, blend the soup until creamy. Adjust with salt and pepper to taste. 1.You can either made store bought croutons or make them yourself. To make yourself, preheat the oven to 400 F. Take around half a loaf and cut up into 1-inch cubes, crust and all. Drizzle with olive oil and sprinkle with salt, pepper, oregano and basil. Toss to coat. Place on a parchment-lined baking sheet in a single layer. Bake for 10-15 minutes, until golden. Keep an eye on it so it doesn’t burn. 2. For the merguez sausage croutons, chop up a few sausages into bite size pieces and sauté until golden, thats it!